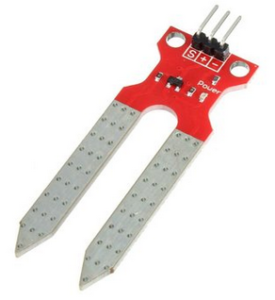 This is a simple moisture sensor for measuring moisture of the soil, when the soil water, the analog sensor output value will decrease, and vice versa will increase. Using this sensor make an automatic watering system, when you are not at home or over a long period of time watering, it can sense whether your plant has been thirsty. Prevent plant wilts know that this is caused by lack of water. 5V power supply, the greater the humidity, the greater the output voltage. Sensor surface made of metal processing, can extend its service life. Insert it into the soil, and then use the AD converter to read it. See here for buy this sensor.